Inspired by connections to the past and the passage of time, Kate’s collection of boxes, containers, vessels and jugs embrace fine art and functionality in one. Her work is renowned for its distinct sculptural quality, often comprising a series of repeated forms grouped together as an installation. This concept of ritual and repetition is central to Kate’s work – one that gives us insight into both her creative process and mindset. A professional member of the Crafts Potters Association, Kate has completed commissions for a number of private and public collections, including British Airways, The Cheongju International Craft Biennale in Korea, the British Embassy in St Petersburg, Craftspace and Cowley Manor. Her work is collected worldwide and features in several printed publications and films. 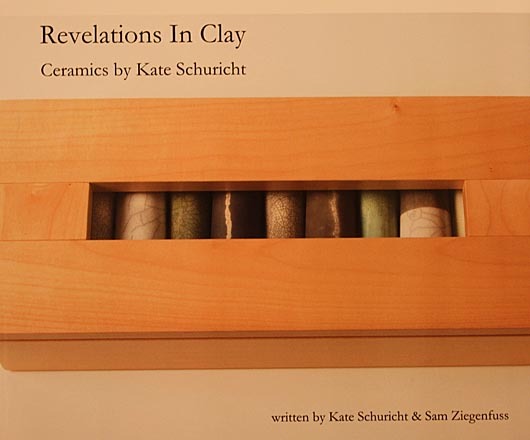 ‘Revelations in Clay’ documents Kate Schuricht’s creative journey from 1996 to 2013 based on a series of interviews and articles from 2012 and 2013.